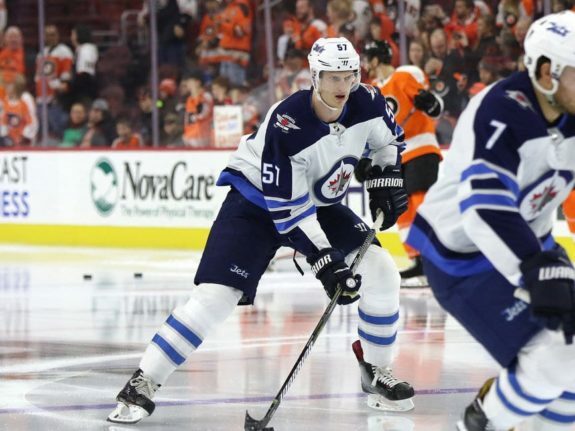 For Winnipeg Jets defenseman Tyler Myers, 2016-17 couldn’t have gone much worse. Myers battled through a comparatively minor injury early but put up five points in 11 games. His advanced stats included a 5.6 percent Corsi-for relative, and he was playing decent hockey. Then it all came unhinged. A slew of injuries was just the beginning for Myers, the worst of which required surgery. This surgery was unrelated to the two surgeries he’d had the offseason prior and would end up shutting him down for the season. As if that weren’t enough, however, Myers and his wife went through some of the tensest months a family can suffer through. After an emergency C-section brought his son, Tristan, into the world five months early, things got worse still. Tyler Myers is the @NHLJets' nominee for the Masterton Trophy, given for "perseverance, sportsmanship and dedication to hockey." Myers’ son had been born without 80 percent of his blood. His life hung by a thread for a long time as he battled a variety of new health problems in the following weeks, including a seizure. But he did survive and was eventually able to go home. After all of this, Myers still had weeks of rehab ahead of him following his third surgery in less than a year. The Jets defenseman would say, however, that it left his injuries in perspective after going through such a harrowing few weeks. By the time September rolled around, Myers was all healed up and back at camp. But more importantly, his son was back home and growing healthily. In so many ways, Myers’s comeback was incredible. While it’s been a tough season at times for the towering rearguard, playing this season at all has to be a win for him on a personal level. Hockey is an important part of the lives of so many, but it is a game at the end of the day. Every year, the stories behind the Masterson Trophy nominees are a reminder of that. This year, Myers’ story exemplifies the Masterton’s purpose. That purpose, as written by the NHL, is to reward the player who “best exemplifies the qualities of perseverance, sportsmanship, and dedication to hockey.” Whatever your thoughts on Myers’ play this season, there’s not much to argue when talking about those qualities. To return to the game of hockey after going through so much on and off the ice is one thing, notable enough in itself. To perform at Myers’s level, putting up 34 points in 77 games and averaging over 21 minutes a night, is another. Myers’ point totals this year are his highest since his second year in 2010-11. He’s still got five games to get over the 37 points he put up that year and is one of just seven Jets to dress in every game this campaign. This is not to take anything away from the rest of the Masterson Trophy nominees. As always, it’s an impressive list of those who persevered this season, including Brian Boyle, who fought through leukemia during his first year as a New Jersey Devil. The Masterton Trophy is the kind of award where it’s impossible to root against any of the nominees. All 31 deserve it in their own way, and all 31 deserve the recognition that comes with a nomination. Rather than pick apart any individual case, it’s better to look at what Myers has gone through and decide for yourself whether or not he’s displayed the values the Masterton stands for. There’s no question he does. It was hard to imagine, this time last year, that Myers would play an injury-free season in 2017-18 (so far, touch wood). Not only has he played injury free, he’s put up his best offensive numbers since he was a fresh-faced NHL sophomore. Other injuries on the Jets’ back end, notably to Jacob Trouba and Toby Enstrom, have thrust Myers into a bigger role. At times it’s led to hiccups, as it’s been obvious that a lessened, spread-out workload suits the Jets’ defense corps best. Yet for Myers to come in and play so much a year removed from multiple surgeries and an awful personal crisis speaks volumes about his character. He deserves the Masterton Trophy. Not that this guarantees he will win, of course. There are 31 players (and probably more) who deserve recognition for this award. The real winner is the sport of hockey for the presence of these individuals. Myers is just one of many such players. But with everything he’s been through, there’s an excellent chance he will stand out among his peers when the time to select the Masterton winner finally arrives. For a man who’s 6-foot-8, standing out is nothing new. But this time will be one he can truly look back on with pride.